Keep it Simple | Y'all Behave! Being a Supernanny, I am well-versed in the toys of now. In addition to shopping for the children myself, I often do gift recon as a favor to parents when their child’s birthday is coming up, and for past nannying gigs I’ve even done the gift buying (for the kiddos and their friends) for the parent. With tons of choices, different versions, “newest” this, “better” that, bells and whistles, navigating the toy aisle in Target becomes a trip into the modern wizardry of toys. When it comes to the kiddos I nanny, as birthdays/holidays come around I opt for books, educational toys, etc. and in my day-to-day nannying duties, I know all too well, that if it’s free, it’s for me! Many times, fun and fancy blossom from very simple items. The brilliance is in the simplicity! I remember as a child being given gifts that were large enough, and therefore probably expensive enough to warrant delivery in a large cardboard box. My folks and I also remember that I not only loved whatever She-ra/ My Little Pony/ mermaid gift was housed within the cardboard box, but I loved the container itself. 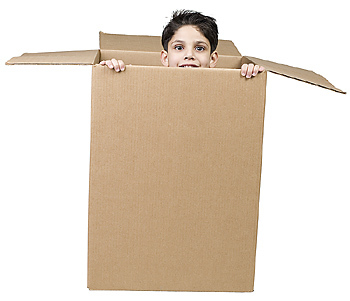 Giant cardboard boxes could become: rocket ships, racecars, a shelter made out of palm fronds when marooned on a desert island- truly the possibilities were endless. Likewise, the kiddos are equally entertained by packing supplies. They enjoy them as not only the means to a toy end, but toys themselves. I spent many afternoons watching Mr. Man and Big Cat en-wrap-tured by bubble wrap, and now I enjoy hearing what Doc wants to make out of cardboard cartons. Just the other day I arrived to see that he and his cousin had fashioned an ice cream parlor out of all cardboard materials! Very impressive! 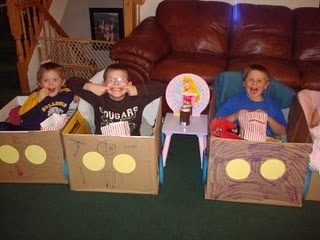 Simplicity in play extends beyond the cardboard castle, and can be found anywhere in your home. Shaving cream is an addition to any bath(click here for its numerous other uses i play! ), sheets draped over chairs make the best forts. 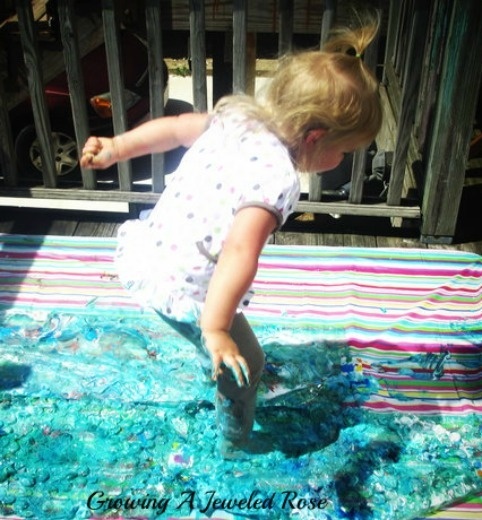 It’s important for me to help the kiddos enjoy the simple things in life, whether it’s climbing trees instead of using playscapes, opting for books instead of television, or playing board games instead of iPad apps. Introducing them to the bare necessities of fun is one of my bear-y favorite things to do. I personally loved shaving cream. My sister Laurel and I used to talk to my dad while he shaved in the morning, and often applied shaving cream to our own faces, “shaving” it off with a spoon. 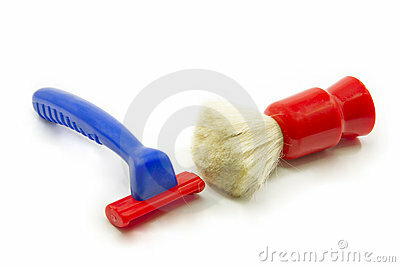 By the time my brother Buddy was a toddler, someone had invented a toy shaving kit! Genius! For my 4th Christmas, all I asked Santa Claus for was a can of shaving cream. Come Christmas morning, I sleepily walking into the living room where a mountain of wrapped and unwrapped gifts awaited me, including a Little Cheryl-sized kitchen center! My eyes, however, lit up most at the sight of a value pack of shaving cream resting on the kitchen center’s stove! Oh sweet simplicity! I ran right past everything else and scooped up the shaving cream with both arms! Best. Christmas. Ever! 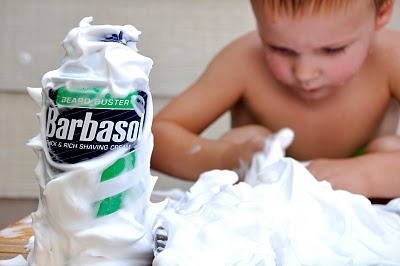 We ended up using the kitchen center for years and years, but honestly my folks could have saved themselves a buck and stuck with the shaving cream; to this day an all-time favorite gift(click here to see what would have happened had shaving cream not been a present present). And it is in this spirit that whenever I receive a package, I hold onto bubble wrap or boxes, just in case a kiddo might have use for them, and I always have a can of shaving cream under the sink…just in case. Ummmm, I think we need a picture of you with the Costco sized pack of shaving cream! I need to raid my folks’ photo albums! That would be a classic candid!